This new work by Donald Coakley is sure to catch the attention of the band world. This piece is an ideal choice for either a concert or contest. All parts are accessible to players of this difficulty level and the various elements of the piece make it a musical and worthwhile venture to work on. Fanfares, cleanly articulated passages, memorable melodies and driving percussion parts are all found in this work. All horn section solis are covered in other voices if four horns are not available. 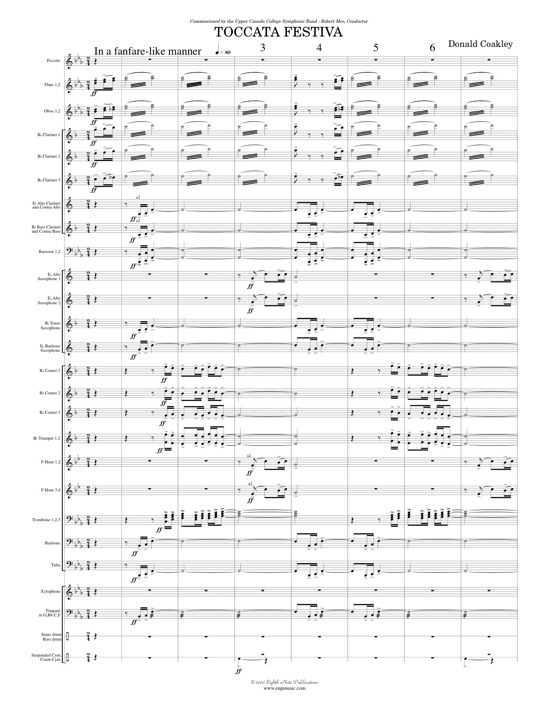 As is customary with other works in the grade 4 to 6 range available from Eighth Note Publications, the conductorrs score comes in an easy-to-read oversized format.